Day three of our family holiday – twenty-five of us on our annual holiday together and today we all went off in different directions. 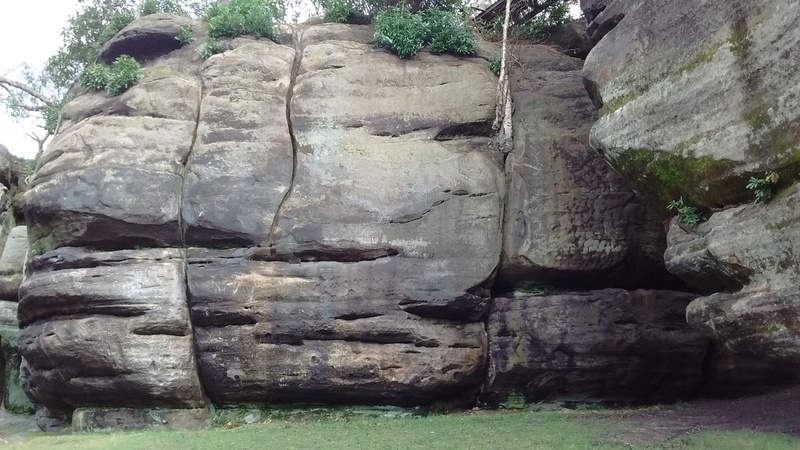 The three of us went to High Rocks which is near Tunbridge Wells. We thought we had been there before and expected some impressive rock faces in some woods… well, I think we had been to a different lot of impressive rocks in a wood, because High Rocks was much, much more! 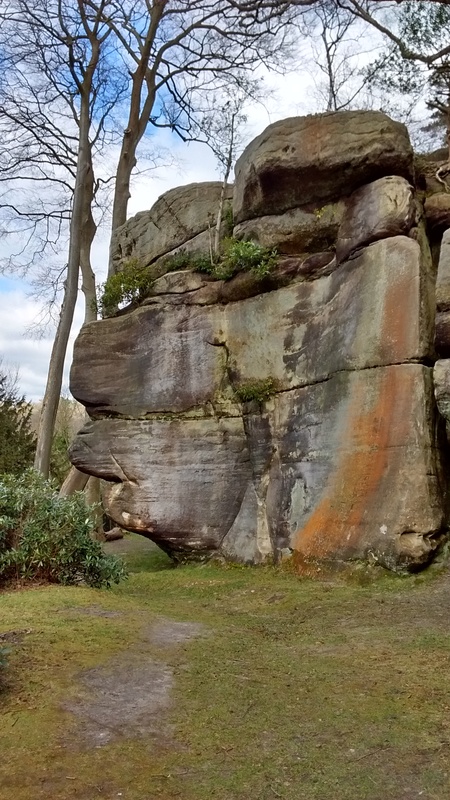 Hugely impressive rocks in a beautiful natural woodland. We loved it – and as we are returning to the same place for our famhol 2016, no doubt we will go there again! Apparently this area was covered by a massive freshwater lake millions and millions of years ago. As you might imagine sedimentary rocks were formed as a result of the layers of sand and silt laid down over time. As the shape of land masses changed, so what had been hundreds of feet below the surface of the water, rose to become hundreds of feet above sea-level. people have lived in this area ever since people first lived in these lands, and there is evidence here at High Rocks going back to Mesolithic times of people being here, hunting, fishing, living… using the shelter of the rocks and caves. As waves of different people came to this area the High Rocks were used in different ways, until today, when we just enjoy them for our leisure activities. We had great fun climbing over them, scrambling up them, squeezing through the narrow passages. The area is beautifully maintained, but without losing its natural appeal. I had a great sense of history as we wandered about, imagining others who had been here before. There was some very old graffiti – it’s not just a modern problem! The area is now used as a venue for different events, including weddings. There are lots of different activities including climbing, bouldering, and going for a ride on a steam railway! There is a very handy pub at the bottom, just in case you need refreshment! So did you get a vodka martini on the rocks. Shaken not stirred please. LOL!! Holiday drinks begin at about sixish – gin and tonic with ice and a slice for them that do – I’d prefer a vodka martini! I actually have Pimms with all the gubbins or dry sherry… then wine with dinner of course! We loved it! We’re coming back next year and will be sure to visit again! Loved the whole area, and Tunbridge Wells is a delight! Thank you, on my way to have a peep!